OS Grid Reference: NY 5651 7466. 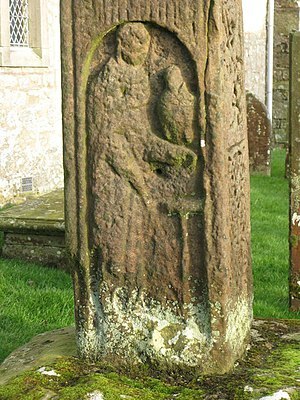 Located in the middle of the remote Cumbrian hamlet of Bewcastle, beside the ruined Norman castle, in the church-yard of St Cuthbert’s stands the famous and highly-sculptured Anglo-Saxon Bewcastle Cross. The village is just a few miles to the north of Hadrian’s Wall and close to the border with Northum-berland. The city of Carlisle is 14 miles to the south-west beside the M6 motorway, while the village of Brampton is 9 miles to the south. At the western side of Bewcastle are the hexagonal-shaped earthworks of Forum Cocidii (Cocidium), a fairly large early 2nd century Roman fort. A Roman road (Maiden Way) runs south-east from here to the Roman wall and another fort at Birdoswald (Banna). 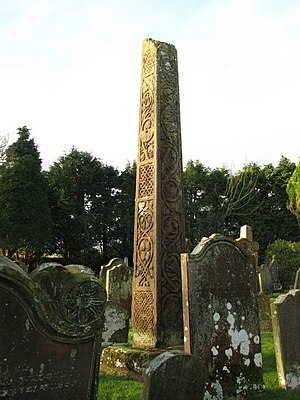 The cross-shaft is made from a single section of sandstone but is now without its cross-head but, even so it stands to a height of 4.5 metres (14 feet 6 inches) and is said to date back to the 7th or 8th century AD. All four sides of the shaft are beautifully and intricately carved in relief with human figures, animals, knotwork, interlacing, scrolls and runic inscriptions, one of which recalls a 7th century Saxon king, which were probably carved by stonemasons from the Saxon monastery of Monkwearmouth in Northumbria. They were asigned to carve the cross by St. Benedict Biscop abbot of Wearmouth in 670 AD and may well have come from overseas; and were they the very same stonemasons who carved The Ruthwell Cross in Dumfrieshire, in the south of Scotland, but which was formerly part of Northumbria? The cross-shaft is richly sculptured with Biblical and other religious and also non-religious decoration on all its four sides. These relief carvings are set inside panels of varying sizes; the west face is considered the best because it has three carvings of Biblical characters. At the top in a panel is St. John the Baptist holding an oil lamp and lamb (Agnus Dei), below which a short runic inscription: GESSUS KRISTTUS ‘Jesus Christ’. The middle panel has Christ in magesty holding a scroll while treading upon two beasts. The bottom carving is that of St. John the Evangelist with his trademark eagle or hawk perched on his wrist. The north face has a rather worn runic inscription at the top, below which there are vine scrolls, knotwork, interlacing and chequers, while the bottom has another inscription to Kyniburg (Cyniburga) the wife of King Aldfrith of Northumbria. It is thought the runic inscription, now incomplete, on the top of the north face should be interpreted as:- THISSIC BEACN THUN SETTON HWAETRED WAETHGAR ALWFWOLTHU EAC OSWIUG CEBID HEO SINNA SAWHULA which roughly translated is ‘This slender pillar (cross) of Hwaetred, Waethgar and Alwfwold set (it) up in memory of Alefrid, a king and son of Oswy’. ‘Pray for them, their sins and their souls’. The east face (top to bottom) has interlinking vine-scrolls in one complete panel, while the south face is carved with three more panels of interlacing, knotwork, scrolls, chequers and a cross; this face also has a very rare sundial that was carved at a later date, but probably medieval. King Aldfrith ruled Northumbria which included Cumbria, the northern Pennines and Scottish borders between 685-704 AD, and was said to have been a scholarly ruler, a patron of the arts, and generous to the monastic church during the late 7th century. Board, Janet & Colin., Ancient Mysteries Of Britain, Diamond Books, 1994. Kerr, Nigel & Mary., A Guide to Anglo-Saxon Sites, Paladin, London, 1982. Maughan, John Reverend., The Bewcastle Cross Inscriptions, Manuscript in Durham University Library. Categories: Ancient Crosses, Bewcastle Cross In Cumbria | Tags: Ancient Crosses, Bewcastle Cross at Bewcastle in Cumbria | Permalink.